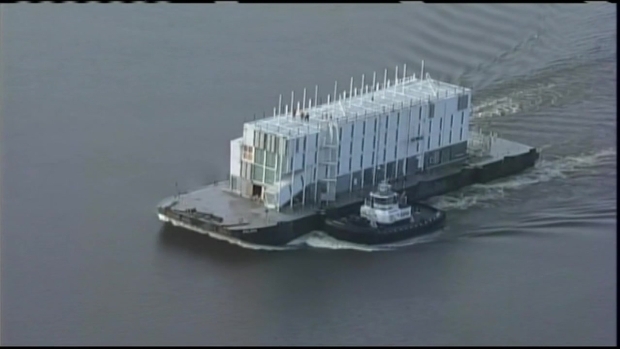 The mysterious Google barge seen floating in the San Francisco Bay has docked in a city sometimes hailed as the "asparagus capital of the world," making its new home in Stockton, Calif.
"It's been a busy six months for our barge and it's grown tired of all the attention," a Google spokeswoman emailed NBC Bay Area. "So we are moving it to Stockton where it can have a break, enjoy the city's delicious asparagus and warmer climate, and get a bit of rest before its next chapter." The barge, which contains some sort of mysterious project in the works that Google has yet to unveil, landed at Stockton's Navy Rough and Ready Island, about 75 miles east of the Golden Gate Bridge, just about 10:30 a.m. on Thursday (PST). It's impossible to tell what's inside the four-story barge painted all in white, as the windows are taped up and security guards the entrances. 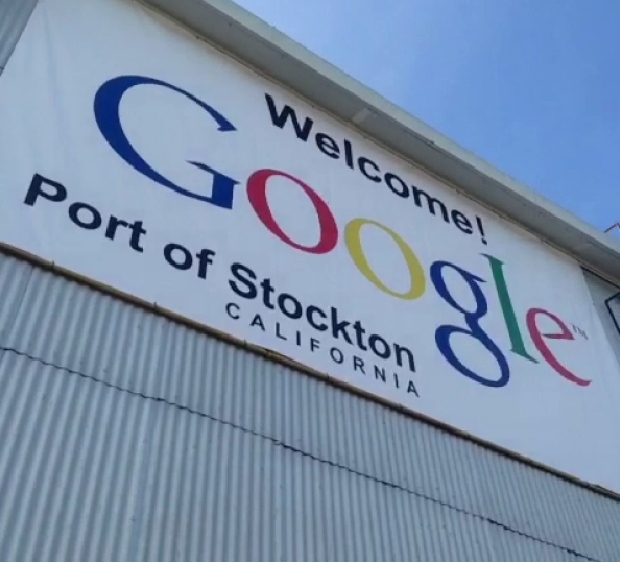 Despite the secrecy of what's inside, the port will house the Google barge for six months, with the tech company paying the standard dockage fee of about $12,000 a month, Port of Stockton Director Richard Aschieris said. The news is seen by some as a boon for the Central Valley city, which, in addition to throwing an annual festival celebrating the spindly green vegetable, has made headlines for filing for bankruptcy and fighting high crime rates. "We're just so pleased they like our facility," Aschieris told NBC Bay Area. The barge left Treasure Island in the San Francisco Bay Area about 8 a.m. PST on Thursday and began lumbering across the bay to the San Joaquin County seat. 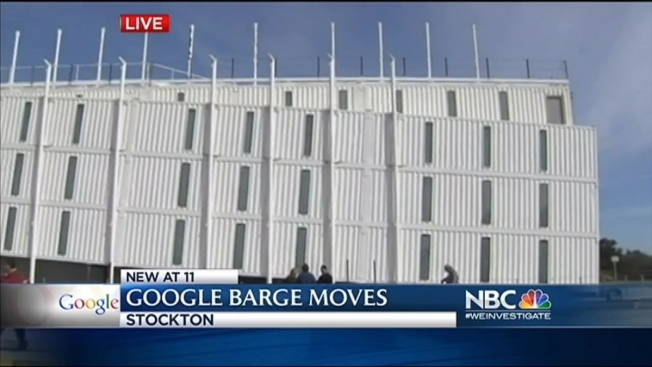 Earlier this week, the Port of Stockton and Stockton officials knew nothing about Google's plans to move its barge. Aschieris said Thursday that the news was "just confirmed at 2 a.m. this morning." Google was recently put on noticed by bay-watchers in San Francisco Bay that its barge would need to acquire permits or get going. Aschieris said he knew nothing about the permitting process in San Francisco, and housing the barge in Stockton did not require any special paperwork. CNET, the first to report that the barge would be headed to Stockton, said that Google was poised to have to pay fees levied by the San Francisco Bay Conservation and Development Commission (BCDC), a California state agency that manages bay waters. Earlier this month, BCDC -- which had been for some time investigating whether Google needed a construction permit to complete the project at Treasure Island -- said that Google either needed to get such a permit, move elsewhere, or begin accruing fines that would top out at $30,000. The agency gave Google a 35-day grace period. CNET reported that the Port of Stockton falls outside the jurisdiction of the commission. Meanwhile, CNET also reported that the construction on the barge went on hiatus in October because there were reported issues with the interior design. 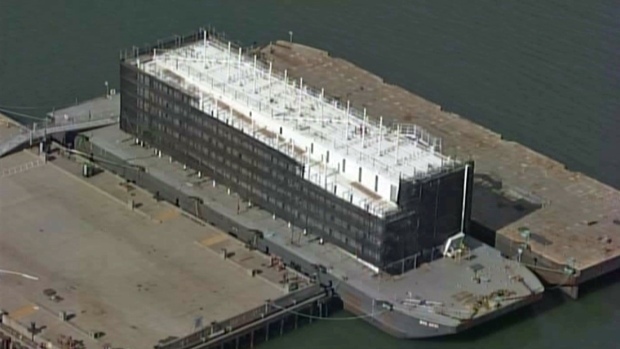 The San Francisco Chronicle uncovered that the large structure was supposed to be a large exhibition space, covered in sails, and would dock in various places. As for peeking inside the mysterious Google barge, Aschieris said he didn't think he'd get any special inside look despite his position. NBC Bay Area's Shelby Hansen and Bob Redell contributed to this report.